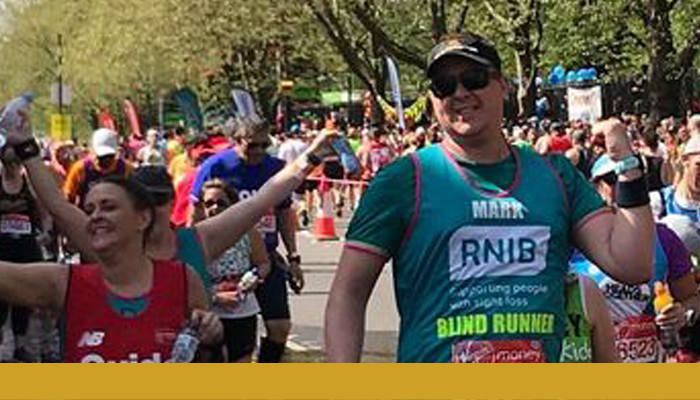 The support given to Mark by RNIB made him run 26 miles! Being told I had a detached retina was a life changing moment. I developed an infection in my eye after having an operation to repair a tear in my other retina. This resulted in me losing the sight in my right eye. After losing my sight, I felt a real mix of emotions, and there were times when I had doubts about the future. That’s when I turned my attention to running. I decided to take part in the London Marathon for RNIB. They’d been a huge source of support after I received my sight loss diagnosis, so it made sense to run for them. I took part in my third London Marathon this year and I couldn’t imagine not being part of it. The atmosphere is amazing, completely unlike anything I’ve ever experienced. It’s a great opportunity to raise money for a cause so close to my heart.